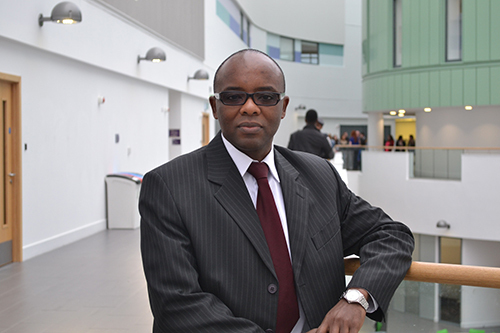 City alumnus Dr James Njuguna is a Reader in Composite Materials & Structures at Robert Gordon University aiming to make millions of car users safer. City University London has played an important role in the development of Dr James Njuguna's burgeoning academic career. From 1999 to 2006, he successfully pursued MSc and PhD degrees in Aeronautical Engineering in the School of Engineering & Mathematical Sciences. He was recently appointed as a Reader in Composite Materials & Structures at Aberdeen's Robert Gordon University. His current research work focuses on developing safe, multifunctional and lightweight composites by quantifying the behaviour of structures in terms of fracture mechanics, impact and crash. His work also involves attempts to reinforce composites in order to improve their performance. Kenyan-born Dr Njuguna is carrying out studies into nanomaterials - the particles released when materials start to break down and degrade. He is developing a benchmarking process for testing the safety of the release of nanomaterials from consumer products. Dr Njuguna worked extensively in the aerospace and motor sport industries before becoming more immersed in academic work nine years ago. He continues to work alongside McLaren and Rolls Royce. Why did Dr Njuguna decide to take up postgraduate aeronautical engineering studies at City in the late 1990s? "I returned to study after working in the aerospace industry. At the time I worked mostly with composite aircraft parts and lightweight aircraft. City was known back then as one of the best places to study and do research in aeronautical engineering and I was already acquainted with a few alumni who were industry leaders in the 1990s such as the then managing director of Kenya Airways." "City was a great experience. I enjoyed being in the aeronautical lab at City and also loved living in London. One challenge was that at the time the aircraft industry was going through a tough period and jobs were scarce." energy absorption as too much either way can have negative effects. If there is no energy absorption in a car's bodywork and the structure is too rigid, the people inside the car will instead absorb the impact. Equally, a car cannot crumple too much or the passengers will again be at risk." "It is an interesting field, with every day being different. Today's materials will not be new in a year's time, so there are always new challenges and inventions. Engineering is a practical discipline especially in its applications and there are lots of opportunities to solve new engineering challenges. The problem-solving skills that one acquires in engineering are always useful in other disciplines." 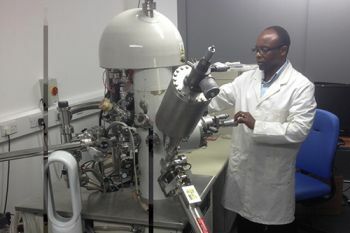 Since arriving in Aberdeen, Dr Njuguna is also examining the application of composites to the oil and gas industry. "Composites are not very widely used within the oil and gas industry. However, there is great potential for them in this sector. For example, it is becoming harder to extract oil and the extraction process is now typified by high pressure and high temperature conditions. This raises two issues - the weight of the pipelines and their durability under these conditions. Composites seem to be a good solution for producing light weight and hard wearing pipelines."